I thought I would share a fun birthday card with you. 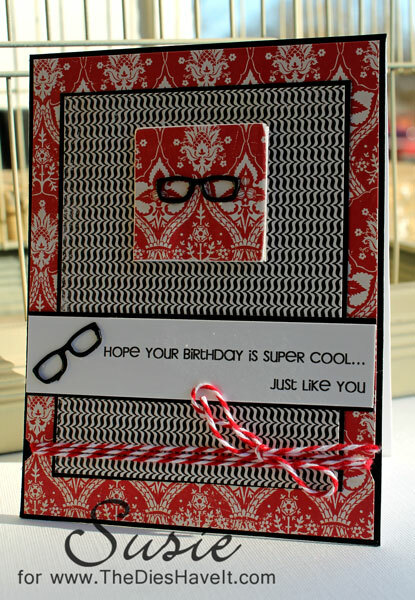 I really wanted to use these Eyelet Outlet glasses, but I was afraid they would get lost on the card....so I used an old trick. I built a little "home" for them. 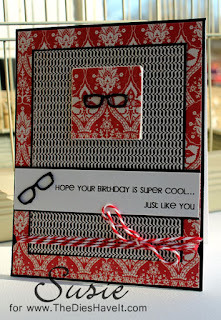 I diecut a chipboard square and covered it with patterned paper to coordinate with my card and THEN attached the glasses. I used another pair on the sentiment which I had just typed onto some cardstock. I am also loving twine these days, so I wrapped some around the bottom to finish the card. I hope you'll be back for my One Buck Wednesday layouts tomorrow.